Last week in my Dan Brown post, I mentioned that I had started reading a “really good book,” only to be interrupted by the irresistible need to prioritize finishing The Lost Symbol asap. So now, with Dan Brown out of my way, I have returned to the good book and am loving it. I could tell within a page of The Shadow Catcher that mmm, this is going to be wonderful. There are two sides of authorship – poetry and prose. On one end of the spectrum, you have Dan Brown and his entirely plot-driven books. On the other end is pure poetry. In this humble reader’s opinion, the best books are those that can tell a compelling story through poetry-like prose writing. 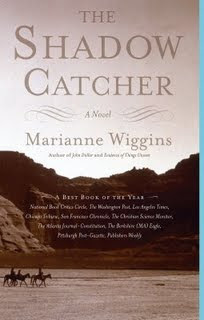 In The Shadow Catcher, Marianne Wiggins does just that – the book is fun to read because the story is great. And it’s also beautifully written. Ooh, major geek-out moment – I love a beautifully written book like I love a good run – mmm, I get happy just thinking about it! BUT, in this case I am very impressed with the authors’ ability to make both stories equally important and interesting! I am engaged with all the characters, present and past, and am interested in both stories equally. My mom mailed me this book, along with another. To decide which one to read first, I scanned the backs – both about the American West. Womp womp. Not my thing. But since my choice was American West vs. American West…I didn’t have much choice. And in case you can’t tell yet, I’m going to go ahead and say that this book is working out quite well. My only complaint is that there are no chapters. WTF? (This is a small thing, but it bothers me way more than it should.) There are major sections (“Parts,” if you will…) but those occur like every 110 pages! This means that when I lay in bed to read before going to sleep, I have a hard time stopping…which is not really a problem usually…until I really want to stop and sleep. Thus, I need a good stopping place. Something. Anything. Fine if there’s no chapters, just a paragraph that ends near the top of a page will do. What? A 3 page paragraph? Are you freaking kidding me??? Hmm…so that’s my dilemma. Does anyone else feel this way? I love chapters/paragraphs/divisions (in case you can’t tell by my writing!). To see Edward S. Curtis' images and for more information about him, check out this site. And if you get hungry while reading, maybe take a break and make yourself some oatmeal cookies. Add in chocolate chips and ½ teaspoon allspice for some extra deliciousness! Bar Cookies: Press dough onto bottom of ungreased 13 x 9-inch baking pan. Bake 30 to 35 minutes or until light golden brown. Cool completely in pan on wire rack. Cut into bars. Store tightly covered. 24 BARS. VARIATIONS: Stir in 1 cup chopped nuts. Substitute 1 cup semisweet chocolate chips or candy-coated chocolate pieces for raisins; omit cinnamon. Substitute 1 cup diced dried mixed fruit. HIGH ALTITUDE ADJUSTMENT: Increase flour to 1-3/4 cups and bake as directed.